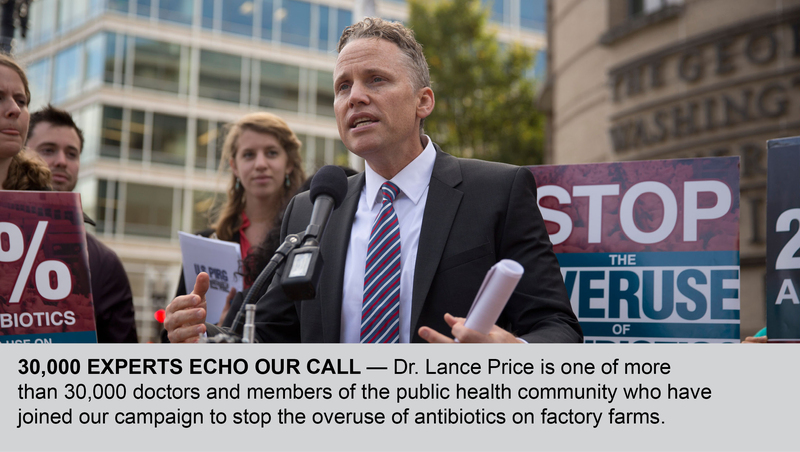 A GROWING THREAT TO PUBLIC HEALTH — The Centers for Disease Control and Prevention estimates that at least 23,000 people die every year from antibiotic-resistant bacteria, and warns that the widespread overuse of antibiotics on factory farms is putting our health at risk. Despite these warnings, many factory farms are giving antibiotics to healthy livestock on a routine basis. Why? Crowded and unsanitary conditions, along with other practices used on factory farms can put animals’ health at risk. But, instead of treating sick animals with antibiotics when they get an infection, many farming operations just distribute antibiotics to all of their animals as a preventative measure. Factory farms also discovered that giving animals a regular dose of antibiotics made them gain weight faster. And now, approximately 70% of all medically important antibiotics in the United States are sold for use in livestock and poultry. According to the Centers for Disease Control and Prevention, "each year in the United States, at least 2 million people become infected with bacteria that are resistant to antibiotics, and at least 23,000 people die each year as a direct result of these infections." And a recent study estimated that unless action is taken, these infections could kill more people worldwide by 2050 than cancer does today. Doctors are also overwhelmingly concerned. In a poll released by MontPIRG and Consumer Reports, 93% of doctors polled said they were concerned about the practice of using antibiotics on healthy animals for growth promotion and disease prevention. In addition, 85% of doctors polled said that in the last year, one or more of their patients had a presumed or confirmed case of a drug-resistant infection. MontPIRG is organizing the public to push for change. We’ve collected more than 200,000 petitions from citizens and families, built a coalition of more than 30,000 doctors and members of the medical community, and enlisted the support of farmers who raise their livestock without misusing antibiotics. Large farming operations and the drug industry have resisted change, and have so far blocked efforts in Congress and from government agencies. But now, we're working to convince big restaurants to pressure these farms to change their practices. In March 2015, we helped convince McDonald’s to stop serving chicken raised on our life-saving medicines. Shortly after, Tyson Foods, a major chicken producer and McDonald's supplier, followed suit. Then, in October, we convinced Subway, with more restaurants than any other chain in the United States, to make a commitment to stop serving any meat raised on antibiotics. Most recently, we helped move KFC, the fried chicken giant, to commit to a policy that by the end of 2018 all chicken purchased by the company in the United States will be raised without antibiotics important to human medicine. As a major chicken buyer, and a company whose supply chain is far reaching, KFC’s new commitment could push the U.S. chicken industry drastically away from the routine use of medically important antibiotics. Unsurprisingly, the industry is fighting back, trying to confuse consumers with misleading arguments about whether these commitments mean sick animals won't get treatment or whether there are antibiotics in the meat. But we know that's not true, and not the problem here. The problem is that farms are giving antibiotics to animals on a routine basis as a preventative measure — not just to treat sick animals. That routine use can turn farms into breeding grounds for drug-resistant bacteria. And that's why our call is for meat raised without the routine use of antibiotics. With thousands of Americans dying, and millions more getting sick from antibiotic-resistant infections every year, it's time for more chains to follow the lead of Subway, McDonald's, KFC and many others.